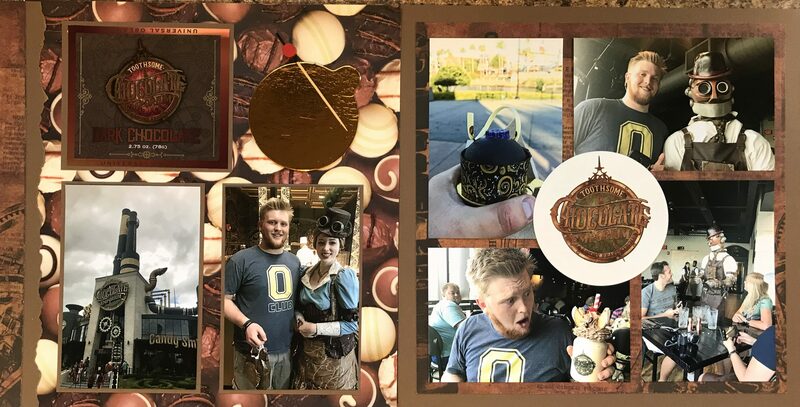 One of the fun places that we discovered on our trip was the Toothsome Chocolate Emporium & Savory Feast Kitchen at Universal Studios Citywalk. We actually ate here twice – once was just to get a shake from the shake line, but then we went back later to eat a full meal! Lets put it like this – don’t go there if you are on a strict diet – it won’t be any fun – it is a place that you have to indulge yourself in! Click on the photograph to zoom in and see the amazing creations that we got to enjoy! For this spread I chose a brown chocolate theme. I used a busy chocolate paper on the left hand side, and a plain brown on the right hand side. Then to balance the spread I chose plain brown borders for the photos on the left hand page, and a busy brown border for the photographs on the right hand page. Ephemera on the page include the wrapper from a chocolate bar (top left), a drink coaster (middle right), and the golden cardboard holding a chocolate dessert that you can see in the top left picture on the right hand page. I know – we are crazy ephemera collectors – I never know what I am going to be able to use! I will share that as I am finishing up albums I do throw about 75% of the ephemera that we have collected away. It doesn’t all make it to the albums.